Green Wisdom School of Natural and Botanical Medicine offers students inspiring diverse learning experiences with courses ranging from short exploratory several hour workshops to professional clinical CAM, Complementary Alternative Medicine, immersion programs. Our school has been providing naturopathic and botanical medicine for 30+ years in the Upper Midwest United States and Ontario, Canada. 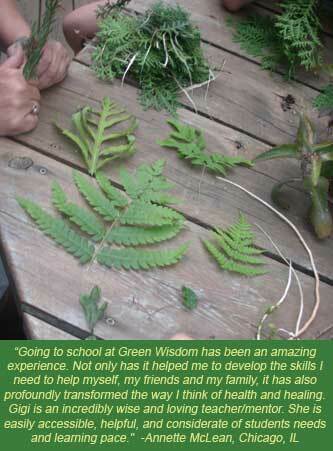 Green Wisdom instruction and guidance connects ancient and contemporary wisdom within the context of education and practice for the newly beginning student to the experienced professional. Our programs open a wide range of experiences within the Complementary Alternative Medicine fields, from herbal medicine making to nature immersion field studies, as well as continuing education professional, business and intensive clinical trainings. Our school offers one of the few formal long term Master of Herbalism Programs in the Upper Midwest and Lake Superior region in North America. Online and CEU courses are classic offerings via Green Wisdom, as well, serving students globally for decades, from Croatia to Canada. Please visit our COURSES page, along with tabs describing educational program options. ...​offers students diverse opportunities that are inspiring, comprehensive and flexible. Our programs integrate Naturopathy, Holistic Health, Herbalism and Ecology into all courses. This means our students receive a true holistic education acquiring unique personal tools to transform their passion into a strong foundational knowledge base, essential for a successful profession in natural medicine. Other students engage in our programs as part of a personal journey to creating a more healthful life. Green Wisdom classes are offered in a variety of formats: formal courses, community workshops, seminars, in-person and online and independent studies--not to mention deep immersion field experiences in nature which are some of our students favorites! Courses blend the intuitive art and clinical science of herbalism, creating a balance that we believe is needed in fields of contemporary medicine. Many of our classes include a formal certificate upon completion. The Master of Herbalism Program is designed for students who feel a calling to botanical medicine and wish to step beyond the basics, adhering not only to the suggested minimal national guidelines for herbalists, but exceeding standards and requirements within the profession. Green Wisdom has been educating students in the natural and botanical medicine field for 28 years, beginning as a Complementary Alternative Medicine clinic in Eau Claire, an hour east of Minneapolis-St. Paul (MN, USA), developed as a component of the Center for Healing Arts founded and operated by, Gigi Stafne MH, ND, MI. That clinic offered a wide range of natural medicine services with a team of 12 diverse practitioners. From there it evolved through Stafne's dedication and commitment into the top-notch North American school that it is today. Gigi Stafne, our director and lead instructor, is a well respected member of the global Complementary Alternative Medicine community, dedicating her career to serving students, as well as local to global communities via Herbalists Without Borders International. Her background and core knowledge is rich with a history of coalition building and promoting wellness in a way that is sustainable, ecological, and returns the focus to a type of health care that is the true definition of holistic. All of these principles and values are transmitted through each of our school's programs. Begin your natural medicine explorations with Green Wisdom!